Most of the old crusty larches I collect need grafting. It seems the older they are, the farther the living foliage is from the interesting part of the trunk. Three thread grafts were started on this larch in spring 2014 and all three of them failed this summer (despite not yet being separated from the donor branch). Three dead grafts. The middle one was the most important as that was to become the new leader of the tree. The one above that… well it was too high i.e. a mistake. I’m not sure why they failed, but I think it might have had something to do with long period of time elapsed. Ideally, once started, a thread graft will grow rapidly and then take within a few months. Unfortunately, these grafts hardly elongated last year therefore they had no change of reaching the thickness required for fusion until they really started to take off this year. But in July of this year when they should have been fusing, they were instead girdled and died. This is purely anecdotal, but I believe that the callus that formed around the edges of the drilled hole was somehow too hardened-off or otherwise too old to readily form a graft union with the threaded branches by the time they were thick enough to do so. Or maybe the drilled hole didn’t form a callus at all. Anyway, they failed and I needed to re-graft. 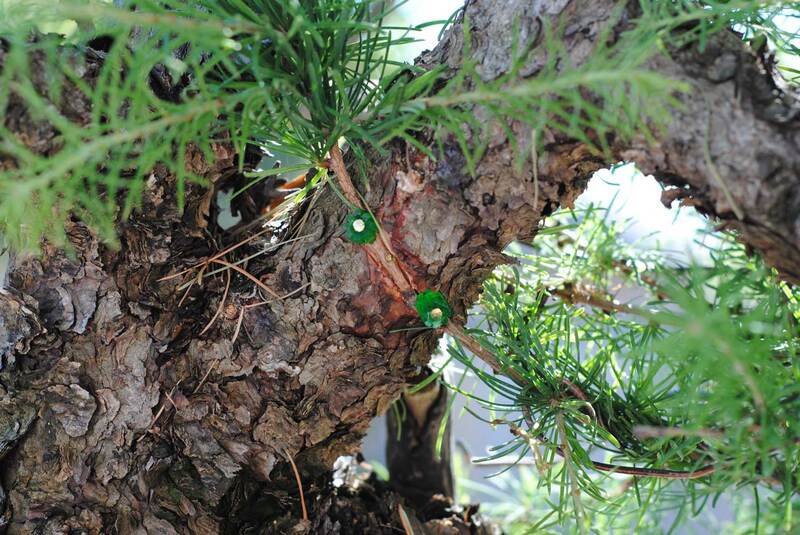 Late summer is not a good time for thread grafting larch, so I tried a traditional approach graft instead. I’m not sure what these nails are really designed for, but in Japan they are commonly used for grafting. With this graft they are not going through the branch, but are just adjacent to it. With thicker branches it is OK to hammer them right through the branch. 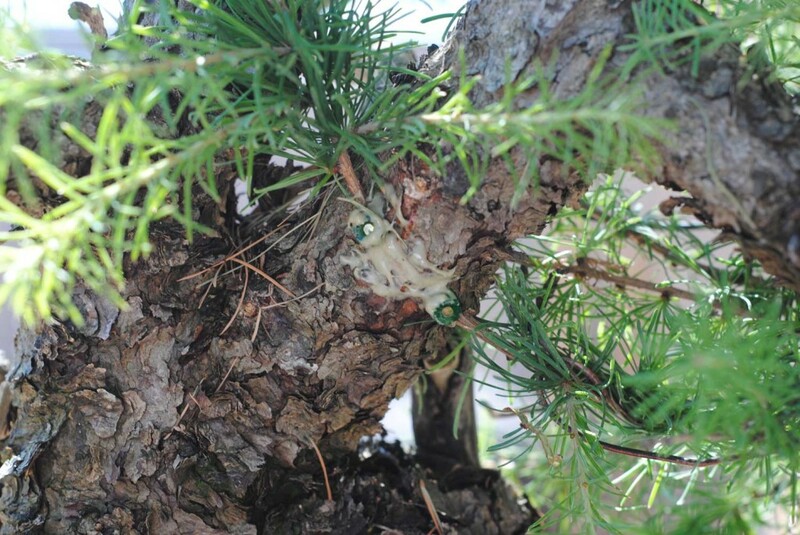 They do an outstanding job of creating a very snug graft junction. This entry was posted on August 4, 2015. 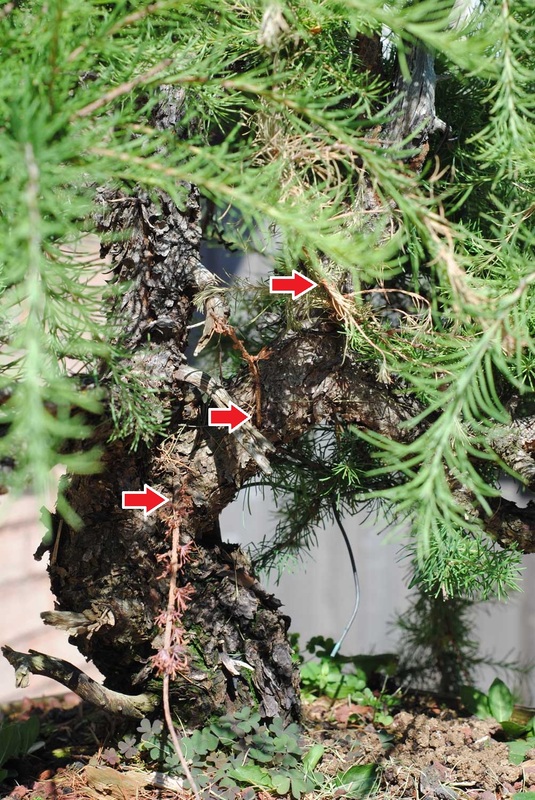 It was filed under Grafting, Larch, Larix laricina, Techniques, Yamadori and was tagged with Bonsai, Canada, Grafting, larch, Larix, tamarack, Toronto, yamadori. Great post, i haven’t had much luck with grafting so far. Where do you get the nails from? I got them from a guy on Facebook who brought a bunch in from Japan. If you are interested send me an email at LakeshoreBonsai…at…gmail.com and I can give you his contact information. You have a gorgeous bonsai collection, I read the previous posts. It is the interesting way of grafting. Never heard about it. Where to find the procedure of it? Can it be used for fruit trees? I did the bud grafting for my fig tree this spring and it is failed. Is it possible to get these nails in Toronto?